The Eastern School’s Chinese Herbal Certificate program is structured to provide flexibility and educational viability for our students. Dr. Thomas Kouo, DAOM, L.Ac., Dipl.OM, the herbal chair of the Council of Colleges (CCAOM), has led a team to oversee the restructuring of the program to maintain current standards from the NCCAOM exam as well as provide a strong foundation for those moving forward into Doctoral level education. Our two day a-week schedule allows practitioners to maintain their thriving and busy practices while keeping the weekly program workload manageable. Students will study and examine clinical cases from our clinic as well as cases from their own practices and learn to diagnose, understand, and treat from a Chinese herbal perspective. Our excellent herbal faculty brings their extensive knowledge and experience to the classroom and clinic to help students learn the many possibilities in the practice of this ancient art. Learning Chinese herbology is difficult, but it is also fun! 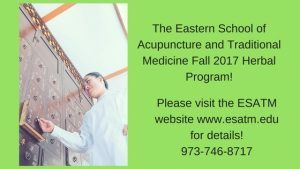 Begin this lifelong learning journey with the Eastern School and join the many practitioners and scholars of this medicine that will continue to shape the way that we live today and in the future. Students who have a minimum of two years of acupuncture education. The deadline for applications is August 1, 2017, classes begin the first week of September. Please contact the admissions office if you have any questions about the application process.